Pitcher plant is a native North American unique perennial plant, 8-24 inches high; a horizontal, round rootstock produces the basal, pitcherlike, purple-veined leaves which are topped by an arching hood and are hairy and sticky on the inside, to trap insects, which the plant consumes. A solitary, large, red or purple flower nods on a naked flower stalk 1-2 feet high during May and June. Grows in swamps, peat or sphagnum bogs, savannas, wet meadows, and wet areas from Maryland to Minnesota and in Canada. Also in California and Oregon. Various plants with slippery, pitcher-like leaves that contain a pool of enzymes that digest trapped insects are called pitcher plants. Most of these grow in swamps and bogs. 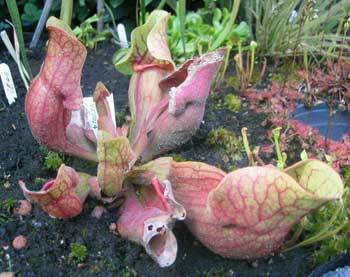 The “pitchers” have smooth surfaces and downward-pointing hairs, making it difficult for insects to crawl out. Once the insect drowns, the leaves secrete enzymes that digest the insect’s soft body parts, which allows the plant to obtain nutrients that would otherwise be unavailable in its habitat. Used to stimulate appetite and improve digestion. Its most interesting use; Native Americans used an infusion of the rootstock against smallpox, both to prevent immunity and to lessen the severity of the disease. It was rejected by the medical profession in the 19th century as ineffective for this purpose, but the evidence was not conclusive on either side. May be a threatened species; best left undisturbed in the wild.